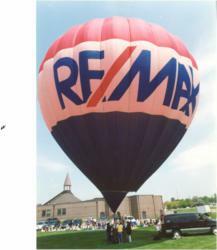 The RE/MAX Hot Air Balloon will visit Sator Sanchez Elementary School, 1101 Harrison Ave., Joliet, Ill., on April 12 when the balloon crew will present an interactive educational program developed and sponsored by the RE/MAX Northern Illinois real estate network. The RE/MAX hot air balloon will visit Sanchez Elementary on April 12. In the audience will be the 1,100 students at Sanchez Elementary, who will learn about various aspects of ballooning, including its history and the scientific principles involved. They also will see a demonstration on how the balloon functions. The RE/MAX balloon has visited more than 50 schools over the last year in northern Illinois. The program will be presented at 9 a.m. outdoors on the school grounds, weather permitting, but can be moved indoors if the weather is inclement. The balloon envelope will be inflated with hot air to its full 75-foot height if the program is held outdoors. If the program needs to be moved indoors, the envelope is inflated with cold air so that students can walk inside it as part of the presentation. RE/MAX has been the leader in the northern Illinois real estate market since 1989. The RE/MAX Northern Illinois network, with headquarters in Elgin, Ill., consists of 2,100 sales associates and 110 individually owned and operated RE/MAX offices that provide a full range of brokerage services throughout the northern one-third of Illinois. Its http://www.illinoisproperty.com and http://www.remax.com websites are leaders in consumer visits among real estate franchise brands. Its mobile search, m.illinoisproperty.com, allows users to conduct real estate searches on any mobile device with Internet access. The northern Illinois network is part of RE/MAX LLC, a global real estate organization with 87,000 sales associates in 87 nations.